WASHINGTON -- In a statement released Sunday, a Yale classmate of Supreme Court nominee Brett Kavanaugh's said he is "deeply troubled by what has been a blatant mischaracterization by Brett himself of his drinking at Yale." Charles "Chad" Ludington, who now teaches at North Carolina State University, said he was a friend of Kavanaugh's at Yale and that Kavanaugh was "a frequent drinker, and a heavy drinker." "I have direct and repeated knowledge about his drinking and his disposition while drunk. And I do believe that Brett's actions as a 53-year-old federal judge matter," Ludington said. "If he lied about his past actions on national television, and more especially while speaking under oath in front of the United States Senate, I believe those lies should have consequences. It is truth that is at stake, and I believe that the ability to speak the truth, even when it does not reflect well upon oneself, is a paramount quality we seek in our nation's most powerful judges." 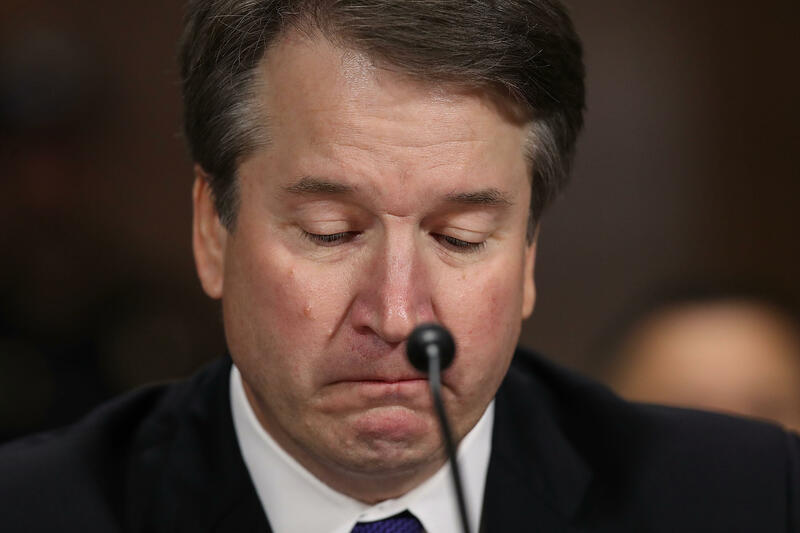 "On one of the last occasions I purposely socialized with Brett, I witnessed him respond to a semi- hostile remark, not by defusing the situation, but by throwing his beer in the man's face and starting a fight that ended with one of our mutual friends in jail," Ludington said. Meanwhile, FBI agents on Sunday interviewed one of the three women who have accused Kavanaugh of sexual misconduct as Republicans and Democrats quarreled over whether the bureau would have enough time and freedom to conduct a thorough investigation before a high-stakes vote on his nomination to the nation's highest court. The White House insisted it was not "micromanaging" the new one-week review of Kavanaugh's background but some Democratic lawmakers claimed the White House was keeping investigators from interviewing certain witnesses. President Trump, for his part, tweeted that no matter how much time and discretion the FBI was given, "it will never be enough" for Democrats trying to keep Kavanaugh off the bench. But Christine Blasey Ford, a California professor who says Kavanaugh sexually assaulted her when they were teenagers, has not been contacted by the FBI since Mr. Trump on Friday ordered the agency to take another look at the nominee's background, according to a member of Ford's team. Senate Judiciary Committee member Jeff Flake, R-Arizona, requested an investigation last Friday -- after he and other Republicans on the panel voted along strict party lines in favor of Kavanaugh's confirmation -- as a condition for his own subsequent vote to put Kavanaugh on the Supreme Court. Another committee member, Sen. Lindsey Graham, R-South Carolina, said Sunday that testimony would be taken from Ramirez and Kavanaugh's high school friend Mark Judge, who has been named by two of three women accusing Kavanaugh of sexual misconduct. Senate Majority Leader Mitch McConnell, R-Kentucky, had gathered Judiciary Committee Republicans in his office earlier. At that time, the scope of the investigation was requested by Flake, Collins and Sen. Lisa Murkowski of Alaska, said McConnell's spokesman Don Stewart. "That's bad enough, but then to limit the FBI as to the scope and who they're going to question, that -- that really -- I wanted to use the word farce, but that's not the kind of investigation that all of us are expecting the FBI to conduct," she said. Mr. Trump initially opposed such an investigation as allegations began mounting but relented and ordered one Friday. He later said the FBI has "free rein." "They're going to do whatever they have to do, whatever it is they do. They'll be doing things that we have never even thought of," Mr. Trump said Saturday as he departed the White House for a trip to West Virginia. "And hopefully at the conclusion everything will be fine." Sanders said Mr. Trump, who has vigorously defended Kavanaugh but also raised the slight possibility of withdrawing the nomination should damaging information be found, "will listen to the facts."